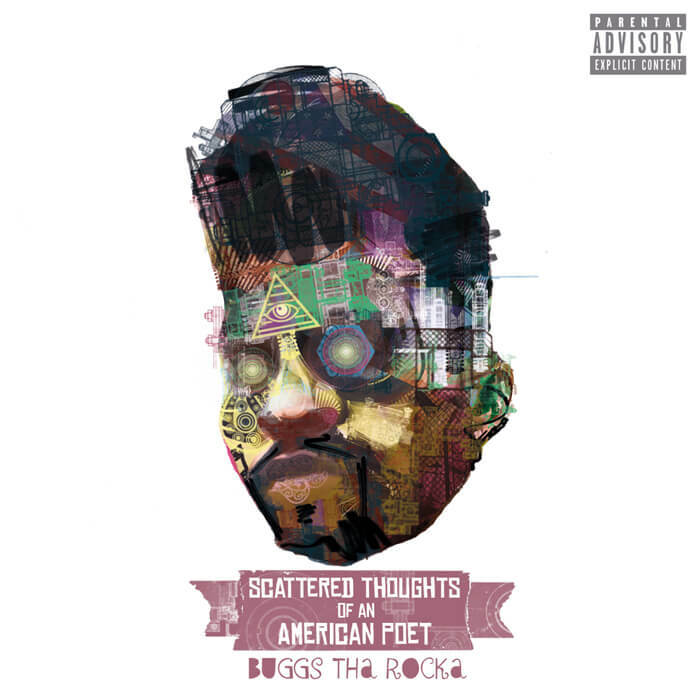 We reviewed Buggs tha Rocka’s Scattered Thoughts of an American Poet. Although not yet a household name, Buggs has been steadily making his mark on the industry. Already the recipient of two Cincinnati Entertainment Awards, his reputation as a gifted lyricists has seen the likes of Talib Kweli regularly bring him on stage, performing to packed audiences throughout the United States. Not content with letting industry gongs and a co-sign from a legend precede him, Buggs serves up free album – Scattered Thoughts of an American Poet – solidifying his position as one to watch for the coming years. As the name suggests, from the moment you press play you will be taken on a journey through the eclectic mind of the Cincinnati rapper. The Sal Dali produced opening number oozes underground jazz club, while just a few tracks later, !llmind uses strings and a haunting female vocal. The dub step tinged Moments Slowed Down is right at home as is the neo-soul sounding Time Machine courtesy of Aida Chakra’s vocals and Hop Trax’s production. All of this sits quite comfortably amongst other tracks that have borrowed elements from the Golden Era polished up for 2014 ears. Drums, pianos and soulful samples form the perfect backdrop for Buggs to lay his poetry over. Just as versatile as the production is the subject matter. Whether it be the socially aware Rapture, ‘turned up’ Phantom of the Opera or the ode to a lady My Everything, Buggs flexes his lyrical muscles showcasing a well honed ability to put life and all its intricacies into clever metaphors, complicated rhyme schemes and creative flows. Despite the ‘scattered’ approach, there is definitely cohesiveness to the project in a ‘this is Buggs tha Rocka’ kind of way. It would be interesting to see what lane the follow up EP and album scheduled for 2015 choose to take or if he will remain as varied. Scattered Thoughts of an American Poet is definitely download worthy, and given its nature, listeners will find more than a few tracks that speak to them.